Leading media members are carrying on a disinformation campaign against the greatest political lightning rod in sports. Their foot-massagers in the media—especially much of the team at Peter King’s Monday Morning Quarterback page at Sports Illustrated—have dutifully repeated these assertions with metronomic regularity. Yet as each of these claims has been debunked by journalists actually communicating with Kaepernick and his people, they all continue to be reiterated. In other words, what is happening is a cycle of disinformation, carried out by media members who might as well wear the NFL brand tattooed on the small of their backs. The logic of this statement, in a league where quarterbacks go down for several games or longer with regularity, is imbecilic. Equally risible is who the Seahawks signed to be their new backup: someone named Austin Davis who has 13 career touchdown passes and 12 interceptions and didn’t play last season. (In contrast, Kaepernick has 72 TDs passes and 30 picks and took a team to the Super Bowl.) Let’s not pick on Davis. Former New York Jet Ryan Fitzpatrick was signed as a backup by Tampa Bay. In one game last season, Fitzpatrick had more interceptions—six—than Kaepernick had all season: four. The list of awful quarterbacks with jobs is long, and each one a slap in the face to Kaepernick’s impressive career, his sterling locker-room reputation and the idea that the league is any kind of a meritocracy. The truth is ugly as sin. The NFL is denying Colin Kaepernick employment not because he isn’t “good enough” but because he is being shut out for the crime of using his platform to protest the killing of black kids by police. This makes the league’s right-wing billionaire owners’ silk boxers bunch up. NFL owners don’t make pariahs out of players who beat women or face accusations of murder. 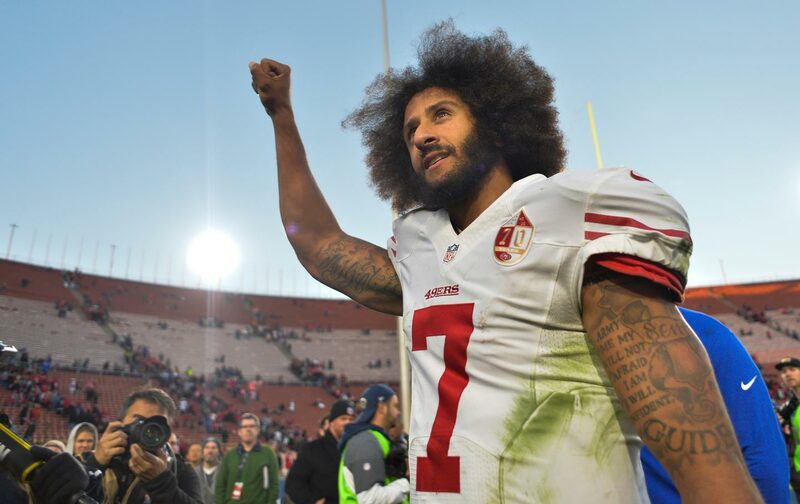 As dutifully printed and tweeted without commentary by Sports Illustrated’s Peter King, New York Giants owner John Mara said that he had received “letters” (letters that no one at Sports Illustrated has seen) showing that fan reaction makes signing Kaepernick impossible. He said this a year after he signed his kicker Josh Brown to a multiyear deal despite seeing detailed and horrific reports about how Brown beat his wife, but Kaepernick’s taking a knee during the anthem was a bridge too far. Kaepernick’s pariah status is about sending a shot across the bow at every political athlete—particularly black athletes—that they better toe the line. The owners are again sending the message—just like when they tried to “influence” research on the effects of brain injuries in the sport—that the lives of players simply do not matter to the National Football League. The big mystery is whether what is happening is an old-school “blackballing” or if this is a conscious and coordinated campaign. Former NFL player Eric Davis implied strongly that he thought that the NFL had contacted the Seahawks and told them not to sign Kaepernick. If this turns out to be true, we are no longer in the realm of blackballing. We are talking about collusion. That could mean lawsuits. Not just ordinary lawsuits, but nine-figure lawsuits. Major League Baseball had to pay out $280 million in 1990, when it was found guilty of collusion, and anytime you’re dealing with the closed market of professional sports leagues, with their myriad antitrust provisions, collusion penalties can cost a fortune. But I don’t think that Colin Kaepernick is going to go the litigation route. At least not now. He loves this sport and he wants to play. Only two questions remain: Will he get signed by a team when a quarterback inevitably goes down to injury, and will his name, until he’s on a roster, become synonymous with the silencing of the political athlete? If an NFL player wants to speak out after the police murder of an unarmed child like Tamir Rice or after another racist killing, will teammates and agents tell him to be quiet for fear that he will be “Kaepernicked”? I don’t know the answer to the first question, but I feel very confident about the second one. Colin Kaepernick will be remembered as an inspiration. The reporters who have thrown dirt on him will be remembered only as the 21st-century iteration of the kind of racism that outspoken black athletes have always had to face.